Test automation for web, mobile, rich-client, and Enterprise applications. 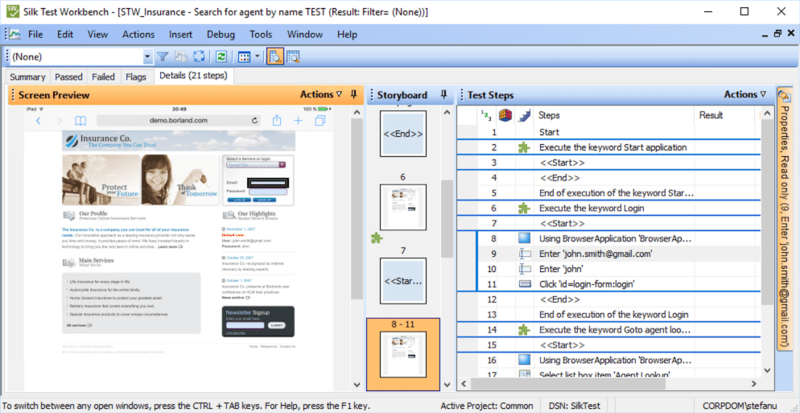 Leverage existing Selenium scripts by recording additional steps in Silk Test for desktops or mobile browsers. Run existing scripts faster by eliminating unnecessary wait-statements. Use Silk Test for regression, cross-platform, and localization testing of all mobile application types, including mobile web, mobile native, and hybrid applications. Create and maintain functional tests to accelerate time to market. Applies to both functional tests and performance tests. Silk Test makes it easy to reuse those tests as performance tests and for synthetic monitoring purposes as well. Maintain rigorous quality standards and accelerate application testing on any device and platform. Standardize your validation efforts by testing web, mobile, rich-client, and enterprise applications using a single, powerful test automation solution. Silk Test makes it easy to integrate functional testing in the CI/CD pipeline. Parallel test execution accelerates test timelines providing prompt feedback on daily check-ins or nightly-builds. Monash University introduced an agile and iterative testing process while saving costs with Silk solutions. Micro Focus Silk Test and Enginuity enable smooth Oracle CC&B upgrade while drastically reducing testing cycles and saving costs. The PinnacleQM Enginuity solution, using Micro Focus Silk Test, realized a testing effort saving of 56%, while testing cycles were reduced by 82%. Business users now only need to be involved for verification purposes against a UAT model, which means that approximately 25 weeks of testing effort per cycle was reduced to less than one week. See how Silk Test software can bridge fast delivery with high quality. Increase the speed and quality of testing in DevOps environments by centralizing test automation for desktop, web, mobile, and enterprise applications without disrupting development tools and processes.